Today is February 29 and that means it's a leap year! I've decided to reveal my March project one day early because tomorrow I am featured at the Benartex blog Sew in Love with Fabric. Enjoy! 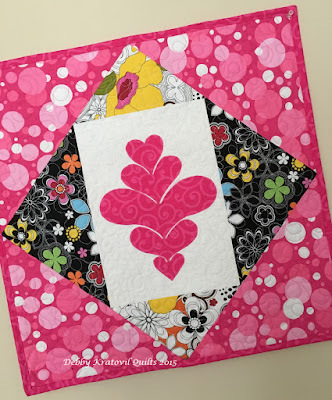 Here is the third project in my 2016 Calendar Girls Quilt of the Month! 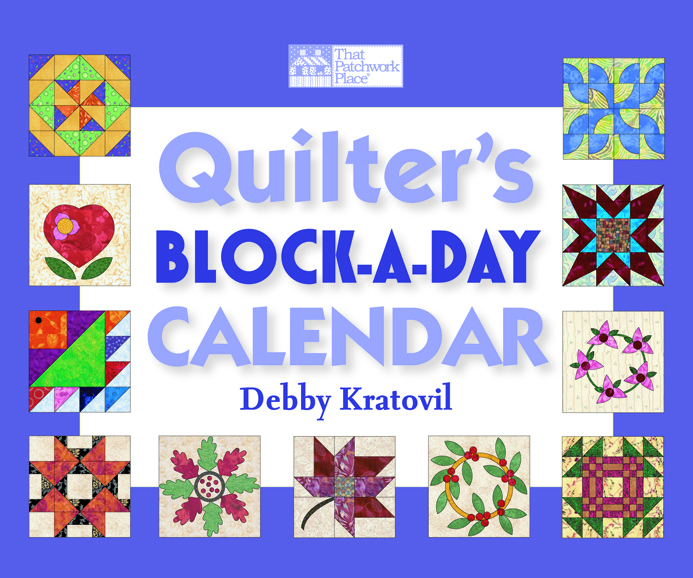 Patches and Leaves Quilt uses the block from March 21 in the calendar. 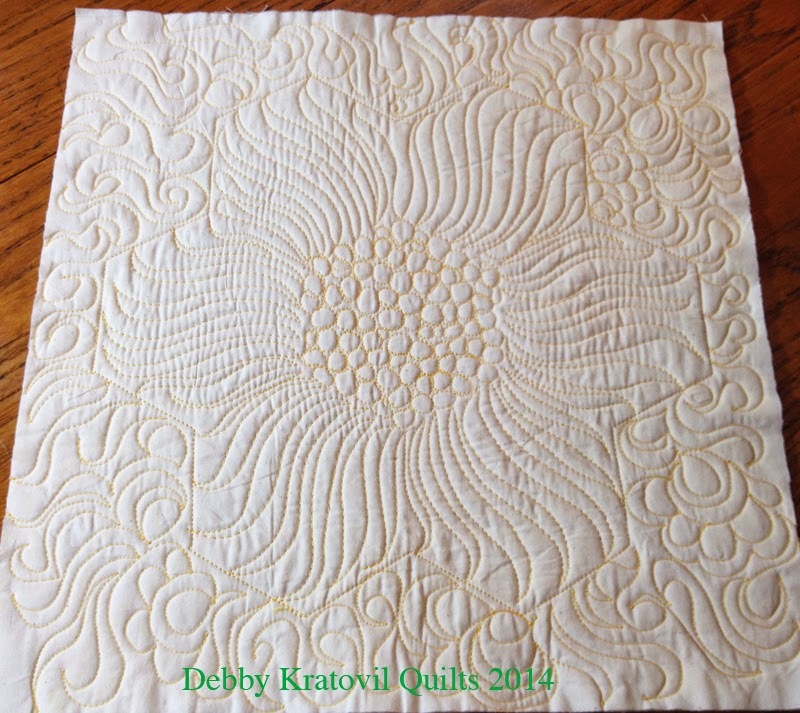 It is a 12" finished block and the quilt finishes to 56" x 68"! 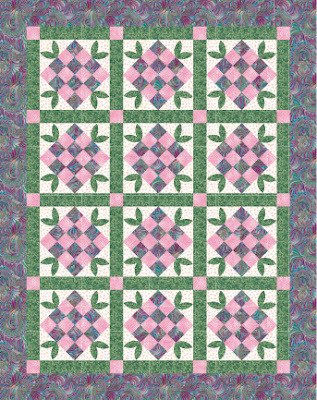 Patches and Leaves: 56" x 68"
Here is the link for the Patches and Leaves quilt pattern with attached newsletter. 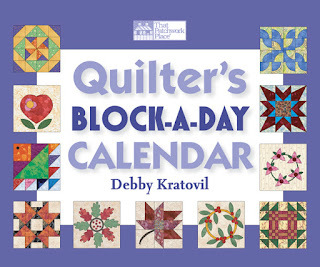 See you next month (April) for our next Calendar Girls quilt. 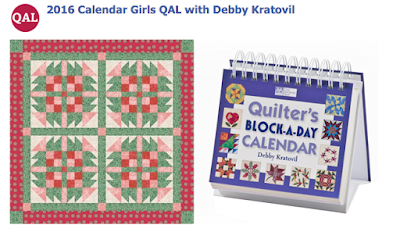 You know about my 2016 QALs (Quilt Alongs), but let me tell you about a few others that are in partnership with my publisher (Martingale). 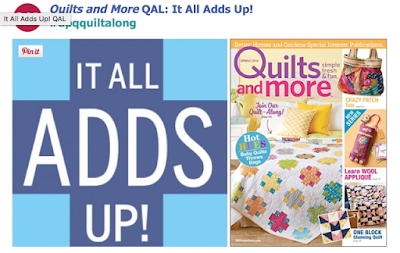 Seems like quilt-alongs (QALs) are everywhere right now—boy, are they are hot! Online QALs are a great way to meet online friends who share your passion for patchwork. Plus, you get the inspiration to start a project and the motivation to complete it. Your online friends will be cheering your progress all the way to the finish line! 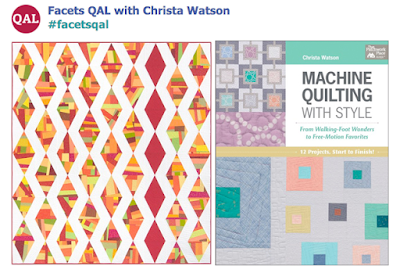 Here’s a quick look at the latest QALs being hosted by Martingale authors, along with a special QAL hosted by our friends at American Patchwork and Quilting that features Martingale’s fearless leader, Jennifer Keltner. A big PLUS in our book! This one you know about! 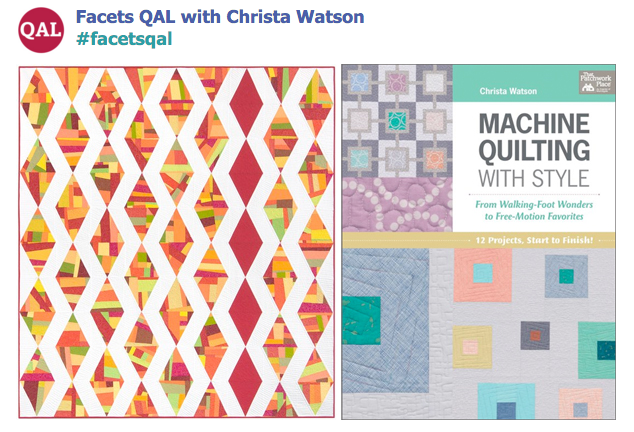 How about the Facets QAL with Christa Watson? 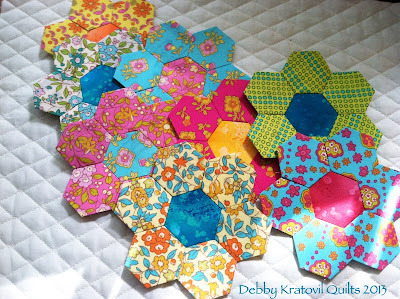 And how about the Millefiore QAL with all these possibilities for using hexies and fussy cutting your fabric? Awesome, I say. This one REALLY appeals to me. I LOVE HEXAGONS! 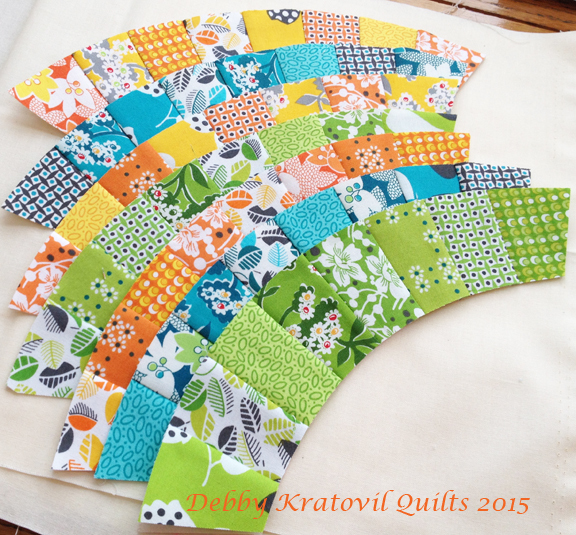 Who doesn't love Moda Fabrics? 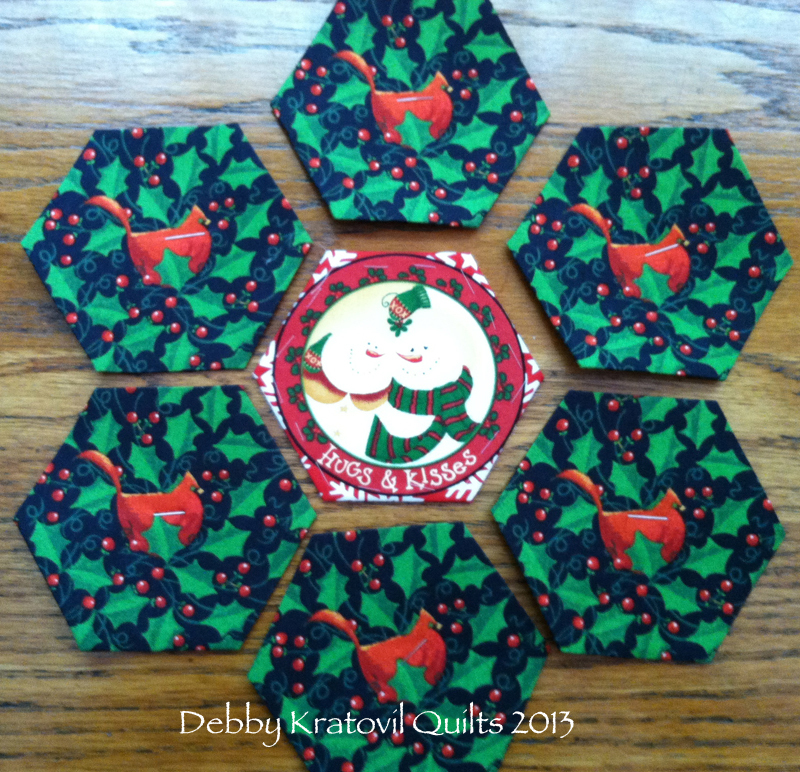 And this Row by Row QAL is made even more creative with the "All Stars" who contributed. Check it out! Quilts and More is one of my favorite quilting magazines. For less than the price of a single, stand alone quilt pattern, you get at least a dozen beautiful quilt projects - including purses, table accessories, etc. 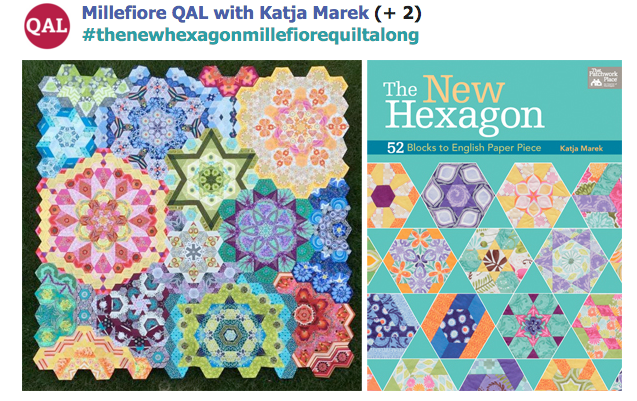 Check out their QAL! 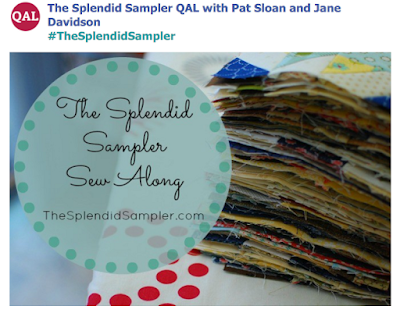 And, finally, a Sampler QAL from Pat Sloan and Jane Davidson. Looks like fun! 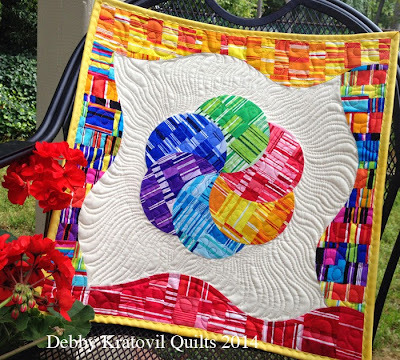 I think you have to agree with me: So many wonderful quilts, ideas and fabric and NEVER enough time. But you have to give it a try, at least. Pick one. And share with a quilty friend! 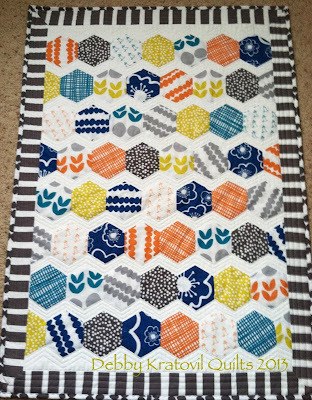 First, I must announce the winner to the Oh, Fudge 10" square bundle of fabrics from Benartex. Nancy R. of Virginia is the lucky winner. Congratulations, Nancy! 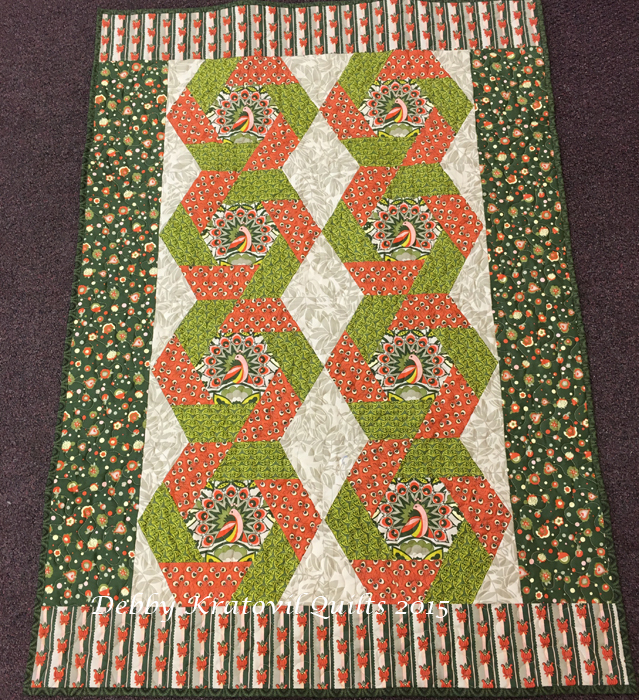 I gave these four to Kathy Gray of Virginia who donated her longarm services to finish them off. Let me show them to you, ok? 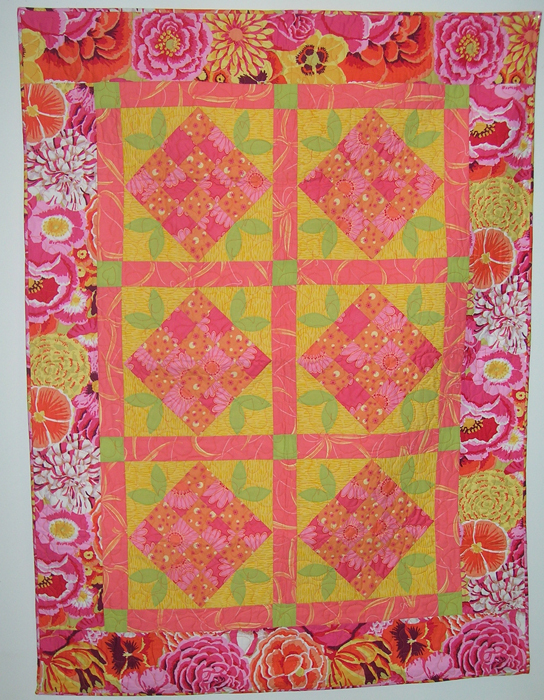 Since my original Butterfly quilt was stolen in 2005, I remade it using some fun bright prints. 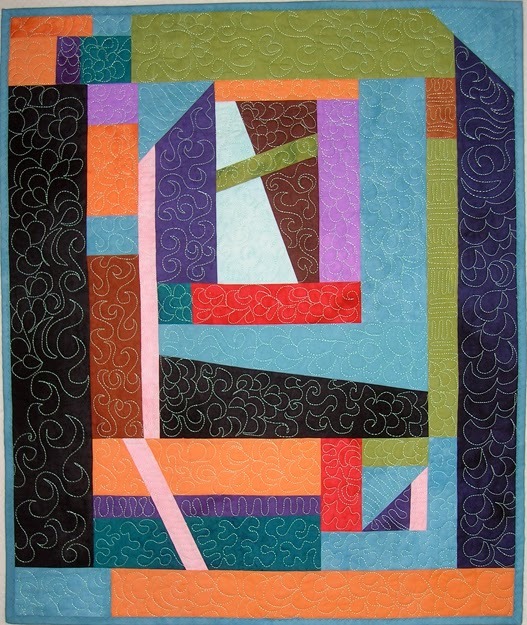 This is 38" x 56"and has gone to a specific hospital wing here in Fairfax, VA called the Butterfly Unit. I understand it is not a happy place as it's full of sick children who are gravely ill. 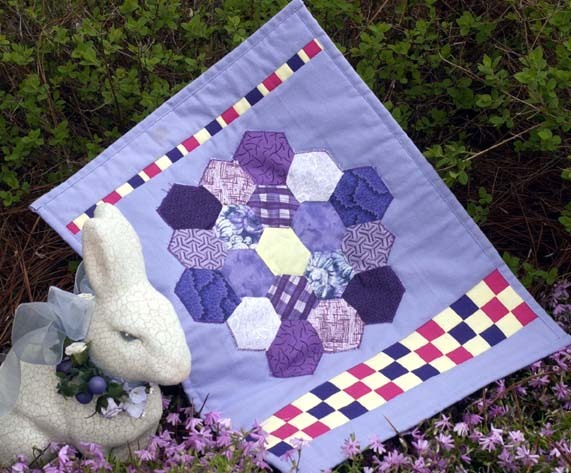 They ask for quilt donations with a butterfly theme. 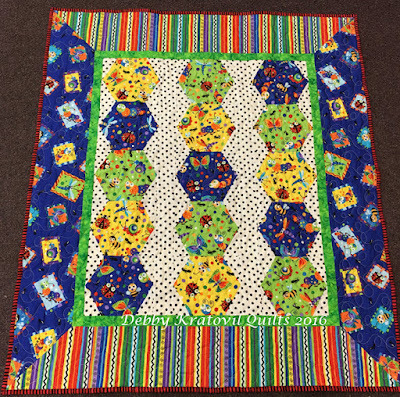 Now my quilt is really happy, to be able to cheer up an ill child! 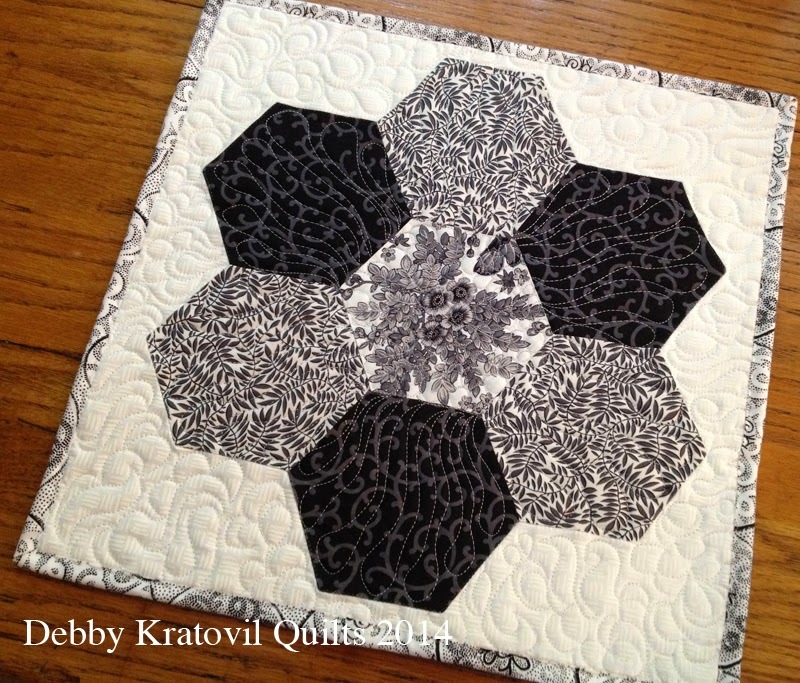 This quilt was just a test-drive using hexagons. No set in seams, of course. 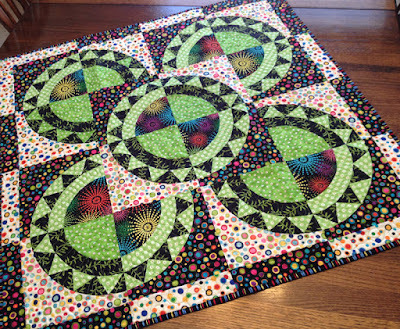 And I used my tried and true Magical Mitering Technique to finish the borders. 38" x 44". 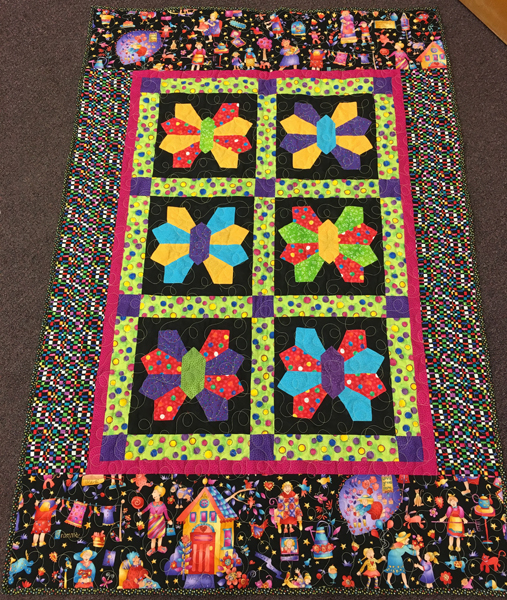 Kathy donated this to another local children's charity. 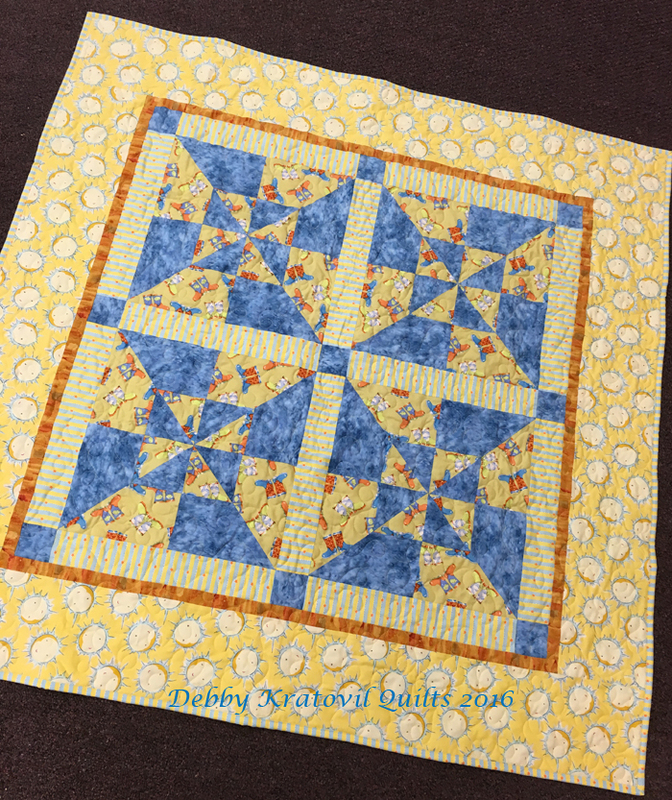 This blue and yellow four block quilt is made using my pattern for the Good Luck Block. 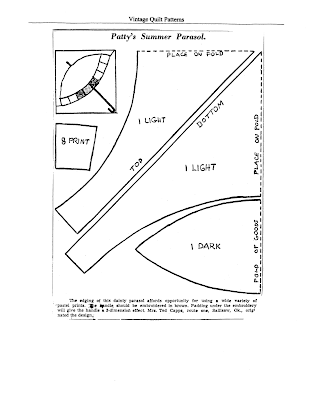 It is sewn using two strips joined with a 1/4" seam. Then the strips are cut apart into squares and then triangles; pieces are swapped and sewn back together. NO templates. 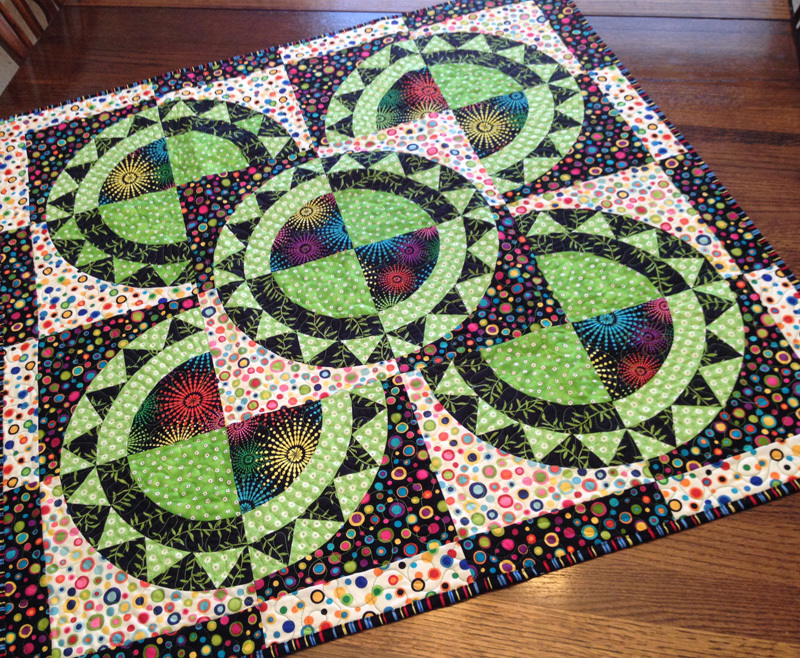 All rotary cut and stitched. I taught this as a class at least 15 times and I've retired the class. Now some little child can enjoy the happy, smiling suns in the border and the rain boots in the center! It measures 46" x 46"
And, the fourth quilt, was made using my Twisted Hexagons pattern. Again, this was a class sample. 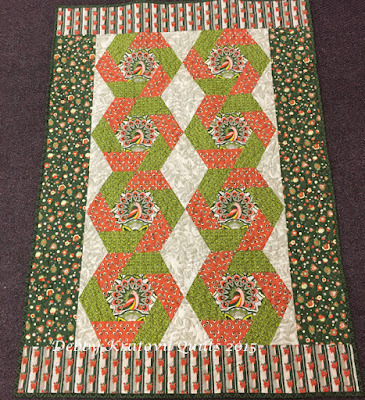 I fussy cut the center hexagons to capture that beautiful peacock. It was a Benartex Fabrics collection called Fern Fancy. 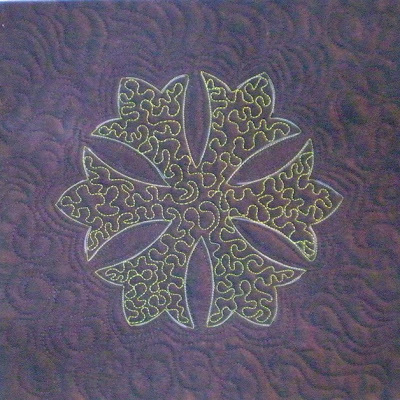 It is 34" x 50". Notice how I had to use two different border prints in this one, too! Whatever works! Just get it into the hands of a child, I say. 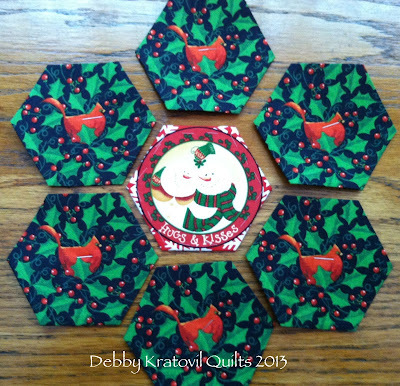 Kathy even put the binding on these four! I had it prepared and she did the finishing. Thank you, Kathy! 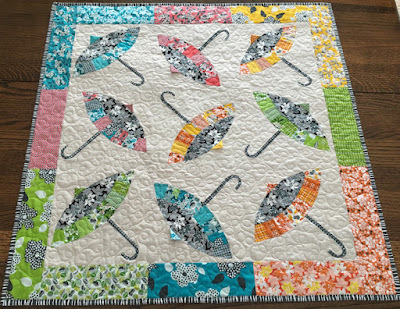 I have several more lined up, especially a few with a butterfly theme. Hope you enjoyed seeing these. 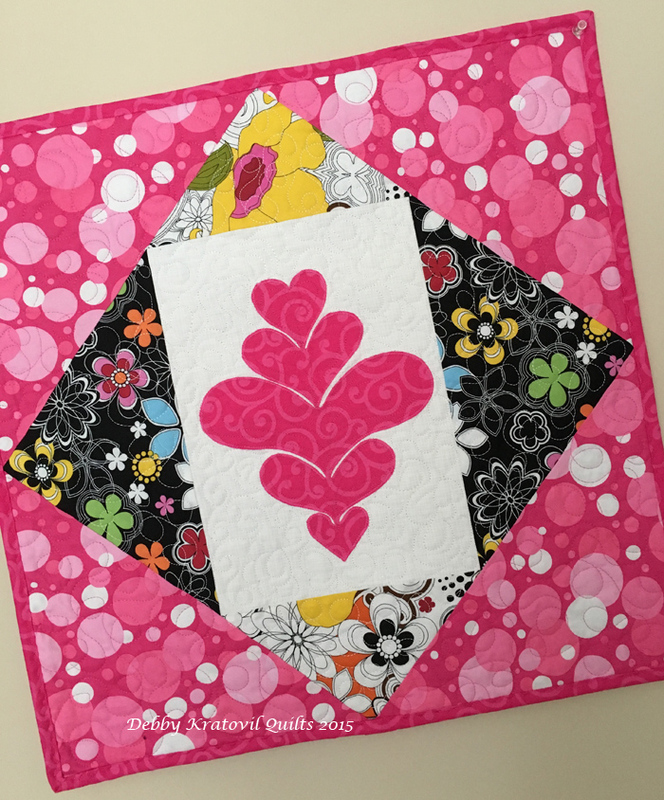 I pulled out my Stacked Hearts pattern and created a freezer paper stencil so that I could free motion quilt in a whole cloth manner. First, I traced the applique onto the paper side of freezer paper. 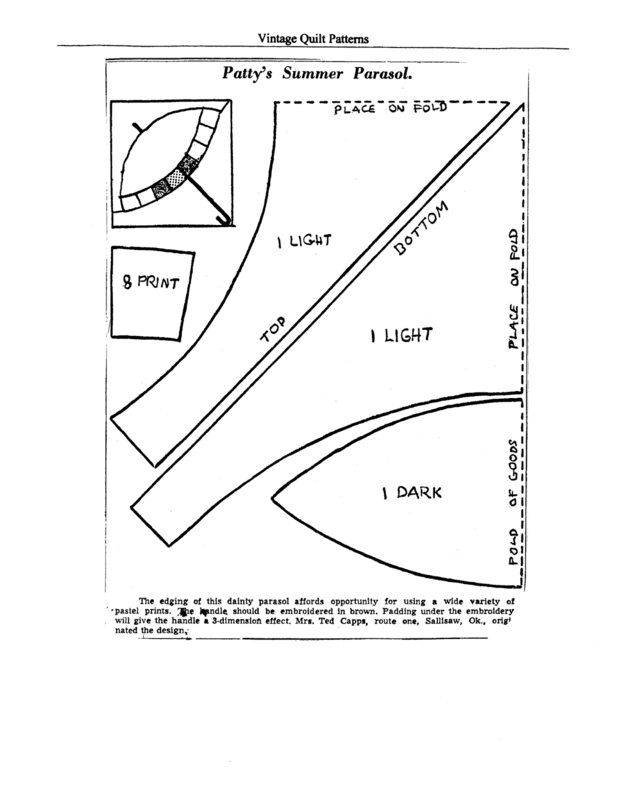 Then I cut it out and ironed it to the center of a shaded pink rectangle of fabric. 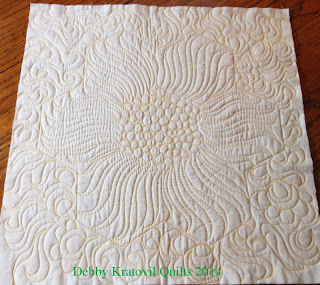 Layered with Warm and Natural batting and a backing. Selected pink thread to blend with the pink. What was my approach? First, I would stitch around the Stacked Hearts template. 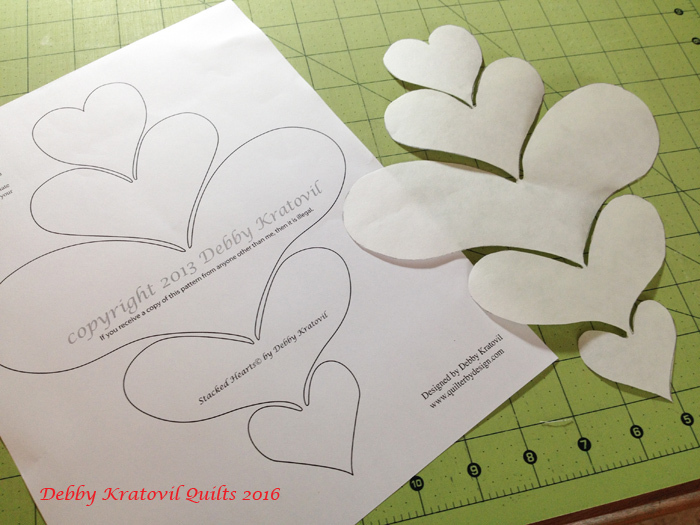 Then, I peel off the paper and free motion quilt INSIDE the hearts. 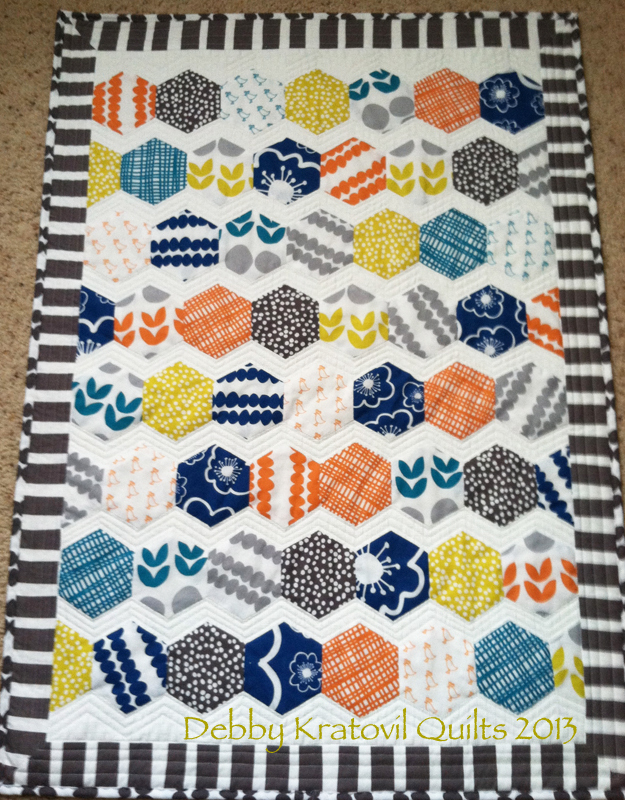 Then, I quilted outside the shapes. Simple. Easy. It sure is better than following a stencil. Just a simple outline. The rest is just doodling. And can we see the quilt, huh? And now let's see how that whole cloth thing worked out! 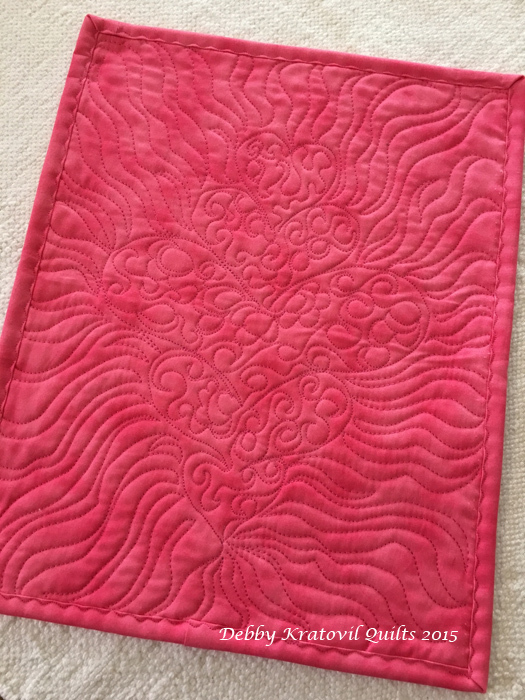 This is a little sample for when I teach Beginning Free Motion Quilting. 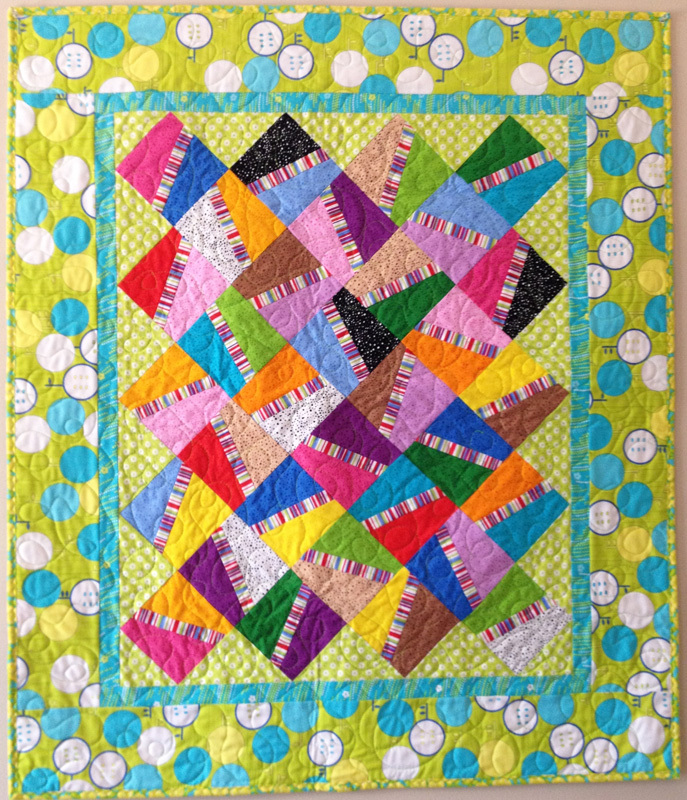 For the Sewing Expo, I teach in the Handi Quilter classroom. 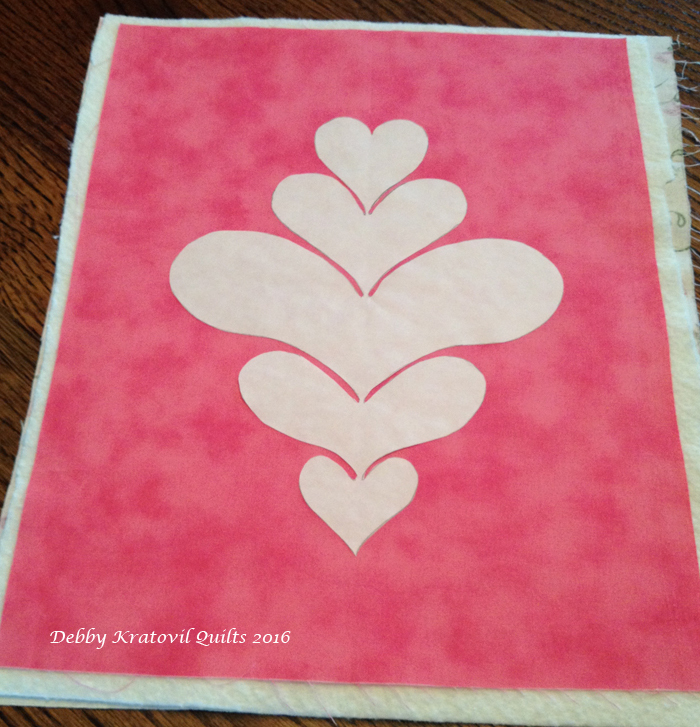 I love working with freezer paper for simple shapes. Hope you enjoyed seeing more hearts! Fudge with NO Calories - and a Giveaway! 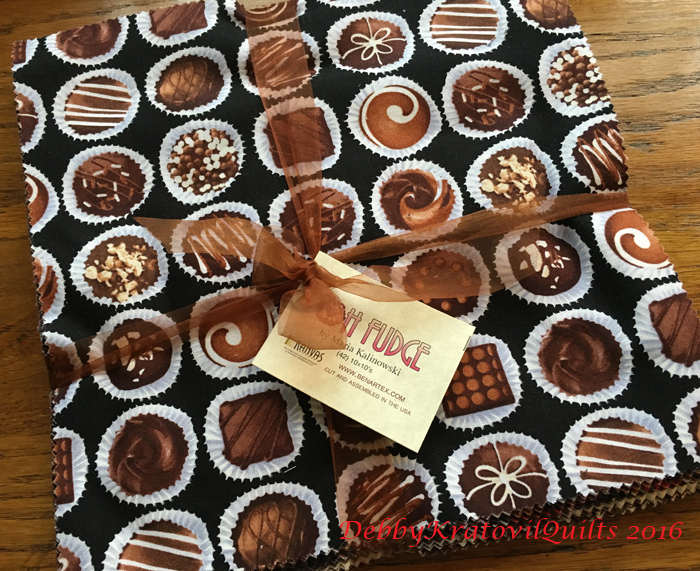 FINALLY have a winner of the 10" bundle of Fudge fabrics. Nancy R. of Virginia is the lucky winner. I have NEW POLICY. There is a 24 hour limit from the time I select a winner and I've notified her (or him). Then I pick another person. If you don't check your email but once or twice a week (and I did have someone take an entire week to get ahold of me, after I chose a second name!) - then I apologize ahead of time. My blog, my rules, my prizes. If that doesn't sit well with you, then, OH FUDGE I say! Yes, it's true. I feature Fudge today that contains no calories. You can consume as much as you wish and not fear gaining a single pound. Today is Technique Tuesday over at the Sew in Love with Fabric blog (Benartex) and I have a quick tutorial using these luscious, no-calorie fabrics. Quite yummy! I selected 6 of the squares to go with some letters I made last February using a reds collection from Benartex. You can see the reds HERE. Remember these letters? Here is the link to the LETTERS. 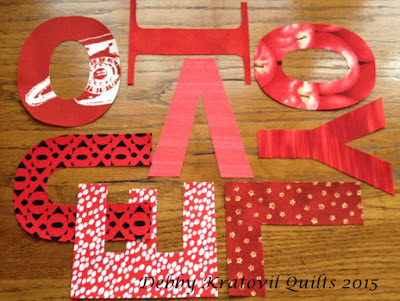 I found it a few years ago for a tutorial for making rag letters for kids. Now what did she do with these letters? Hmmm? Here's what I did with the LOVE letters. 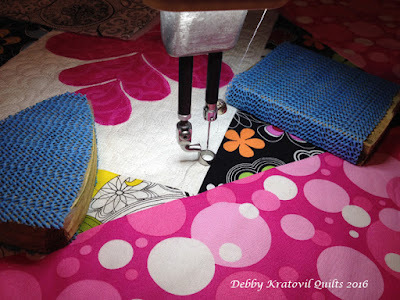 Go see what I did with the rest of them at the Sew in Love with Fabric blog today. Then come back here and let me know you visited and saw the tutorial. 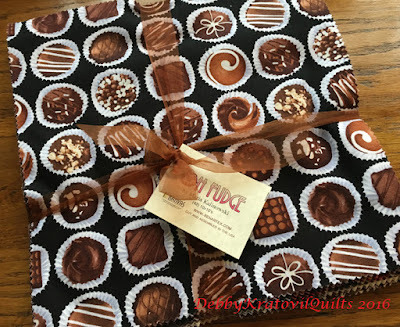 You will then be entered in a GIVEAWAY for a BUNDLE of 10" squares of Oh Fudge, just like the one at the top of this page. 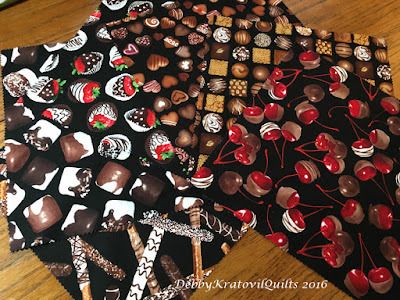 Tell me what your favorite sweet is (candy, cake, pie, ice cream) and you'll be entered to win that bundle of yummy 10" squares. 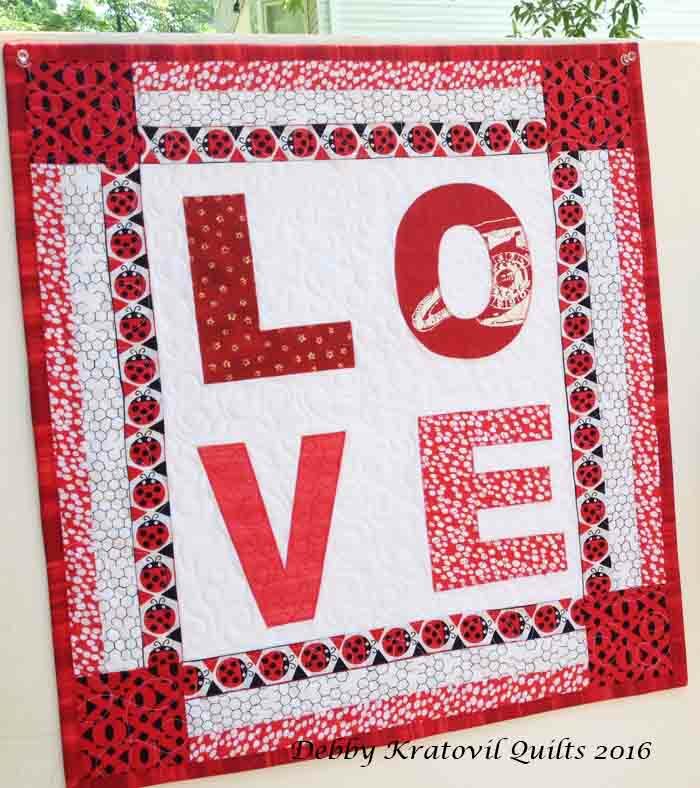 Contest is over Tuesday, February 16. Just wanted to show you some new quilts that are new workshops. 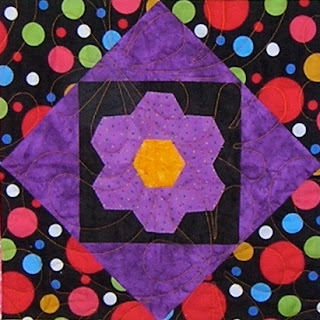 I begin teaching these in March for the Original Sewing and Quilt Expo. First comes Atlanta and then Lakeland, Florida. A week off and then to Cleveland, OH. 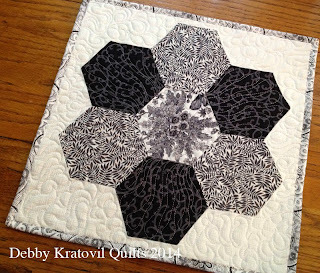 Ezekiel's Crown is a paper piecing project that adds curved piecing. It is not for novices but for those wanting to learn several techniques to expand their skills. Not hard, just takes a little time to put it all together. Don't you love the center? It's what I call "When Four Blocks Make Five." Second is Patty's Summer Parasol, a redo of an old, traditional block. This is a variation on a Double Wedding Ring (can you believe it?) It appeared in newspapers in 1953. Can you believe these templates? Pixie Sticks is created using a Charm Pack for the blocks! 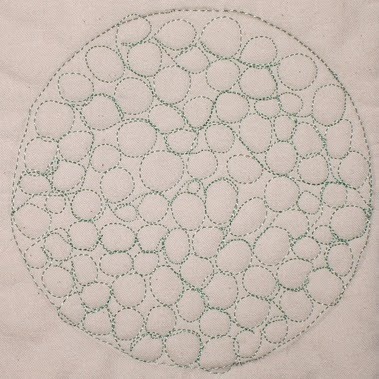 Tight Knit Circles: 17" x 17"
Yes, you can even fussy cut the center motif! And the class I teach in every city, every year for the past 8 years: Basic Free Motion Quilting! 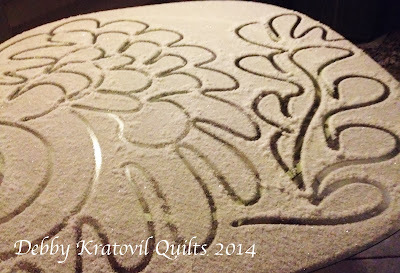 I even practice on snow out on my deck table! An inch of snow can be a great surface to practice your skills! Hope you'll join me for some fun if you live in or near these cities. 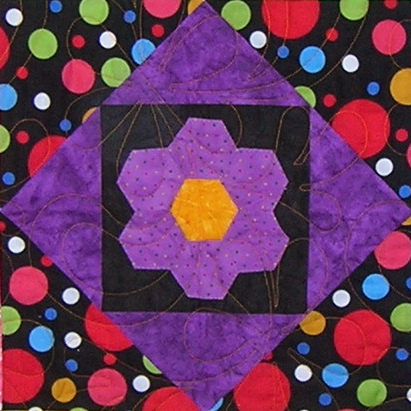 Check out the dates at the main page for the Original Sewing and Quilt Expo.